Tarpey Group HR Solutions offer strategic consulting to help organizations protect and develop their most valuable resources - their people. Successfully managing today’s workforce while navigating a growing complexity of regulatory requirements is becoming increasingly difficult. By offloading the administrative burden of HR to the trained professionals at Tarpey Group HR Solutions, your team can focus on your core business objectives. Companies that work with us enjoy the peace of mind that comes with having a qualified and engaged workforce. The search for great employees is the single most critical process your company can take. With the success of your organization hinging on these decisions, it is important to think strategically about how recruiting affects your organization. 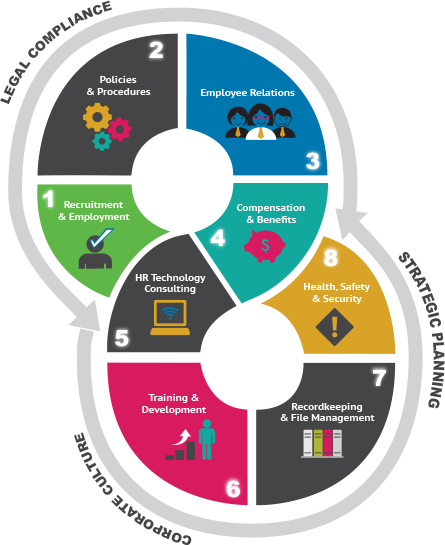 We will work with your business to make sure that the HR essentials are in place, to ensure compliance with employment legislation and adhere to best practices. This may include new policy development, employee handbooks, job descriptions, organizational charts, standardized employment agreements, essential health and safety programs, and training. Handling and resolving conflicts that arise in the workplace is one of the biggest challenges employers face. By learning to constructively resolve conflict, we can turn a potentially destructive situation into an opportunity for creativity and enhanced performance. Your total compensation strategy defines what is needed to attract, motivate and retain skilled employees to drive business results. We will help you to review and develop a total compensation package that supports your business strategy and objectives. We know HR systems and more importantly, we know how to help organizations like yours become more strategic, efficient and profitable through HR technology. No matter what phase you are in, we can help you determine the solution that will work best for your organization. Great organizations have one thing in common - strong leadership. That is because they identify, develop, nurture and retain their leaders, and therefore build an organization that is aligned, innovative, and capable of meeting the challenges ahead. Managing employee records is an important aspect of Human Resources, but maybe confusing as employment laws require different documents to be kept for varying time periods. These restrictions may make the process a challenge and can become troublesome if you're facing a lawsuit and the necessary paperwork isn't readily available. Providing a healthy, safe and secure environment is not just a concern for manufacturing facilities. All organizations need to be aware of issues pertaining to the health, safety and security of their employees and vendors, as well as clients or customers.